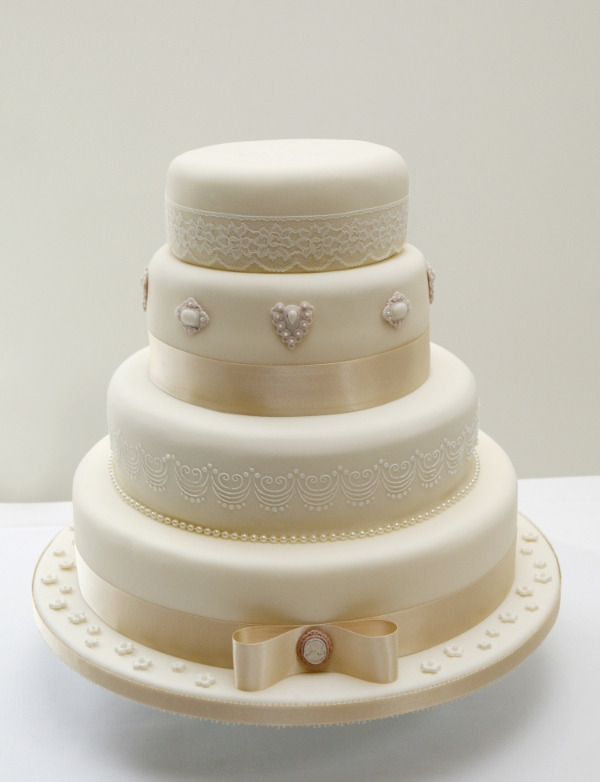 My dress was the first thing to inspire the cake - ivory in colour and with a complete lace overlay. My bridesmaids dresses were a pale creamy mocha colour and they complemented the ivory perfectly. This, I decided would be the base for the colours of the cake and its decoration. I didn't want to over complicate the cake. So much of the day and its styling were kept to a minimum so I picked choice details that I wanted to feature in its design. The lace ribbon used around the top tier and royal icing on the 3rd matched the edging on my veil and the edible broaches were inspired by some vintage jewellery that I had seen when buying my dress. I wore pearls on the day so wanted a string of these on the cake as well. As important as the cake itself was to me, so too was the setting for where it was displayed. The day, like so many do, was full of romance and I wanted this to be felt in the way that the cake was presented. I chose some old and much loved poetry books to decorate the cake table along with some candle lights and rose petals. I wanted the cake to have a special place in the day and to sit alongside other beautiful things. If there are elements of your day that you would like to feature in your cake design or presentation then let me know. The wedding cake no longer has to be a stand alone object in the corner simply waiting to be cut, it can be as big a part of your day as you want it to be!